Captain Peter Hammarstedt and his international crew of Sea Shepherd volunteers onboard the Bob Barker have been at sea now for 108 continuous days. 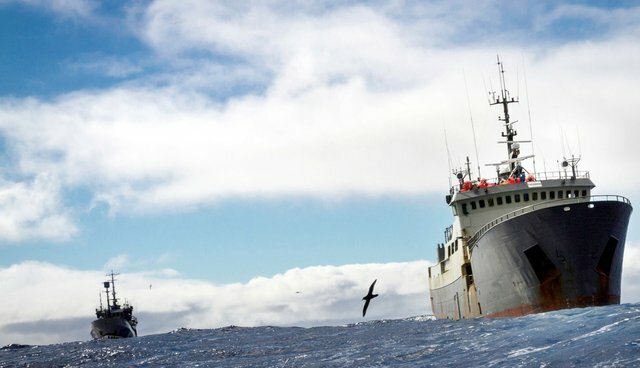 And today marks the 93rd day of their pursuit of the Nigerian-flagged, Spanish-owned Antarctic toothfish poacher Thunder. The chase that began off the Banzare Coast of Antarctica crossed the Indian Ocean into the South Atlantic and now both ships are in the Gulf of Guinea off the coast of Angola on a course of 344 True at 8.3 knots. The 0600 (UTC) position was 16 Degrees, 38 minutes South and 005 Degrees, 37 Minutes East. Wherever the poachers go, Sea Shepherd intends to follow to prevent them from changing the name and flag of the Thunder in port. This is the longest pursuit of a poaching vessel in maritime history. Meanwhile the toothfish-poaching vessel Kunlun continues to be detained in Phuket, Thailand after changing their name to Taishan and switching their flag from Equatorial Guinea to Indonesia. They offloaded their cargo of 180 tons of toothfish with a false declaration and had it shipped to Vietnam. Thai authorities are saying they have demanded the return of the cargo and may place it back onboard the Taishan and order them to leave port. Officials from the Spanish fishing company Vidal Armadores arrived in Phuket and apparently are working to get the detainment of the ship and crew lifted prior to the arrival of inspectors from INTERPOL, Australia and New Zealand. Will the poachers avoid prosecution? The possibility is that they will, considering that the money behind these illegal fishing operations rivals that of illegal drugs and guns.